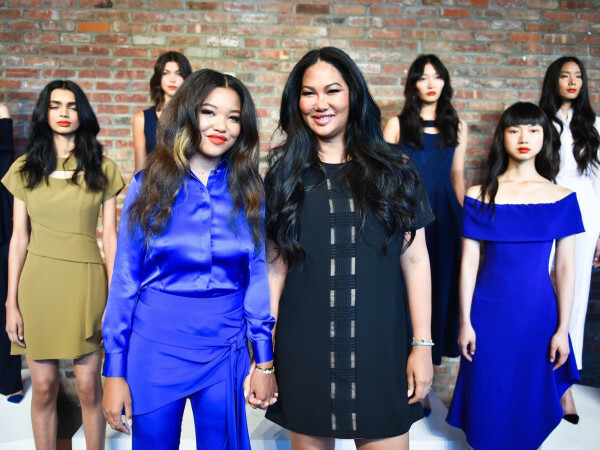 At every New York Fashion Week, The Blondes always have more fun. 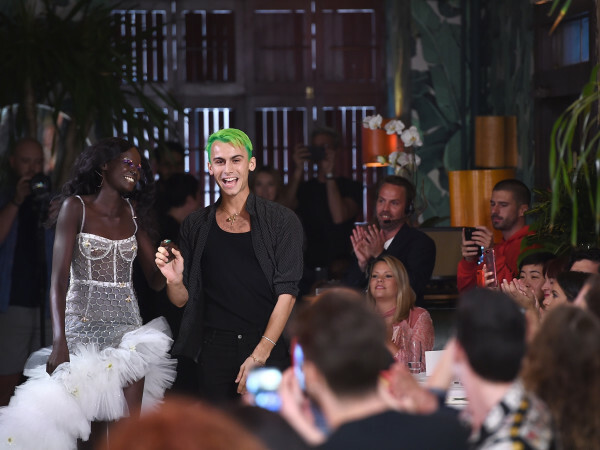 But in celebrating their 10th anniversary as a fashion duo, David and Phillipe Blond pulled out all the stops in presenting their spring/summer 2017 collection before a standing-room only crowd of enthusiastic fans. The Blonds, who have have dressed just about every pop icon, including Britney Spears, Madonna, Lady Gaga, Beyoncé, and most recently, Gwen Stefani for her This Is What Truth Feels Like tour, presented a ton of glittery superstar looks that paid homage to Venus and Aphrodite, with a little bit of Tina Turner, circa Thunderdome, thrown in. 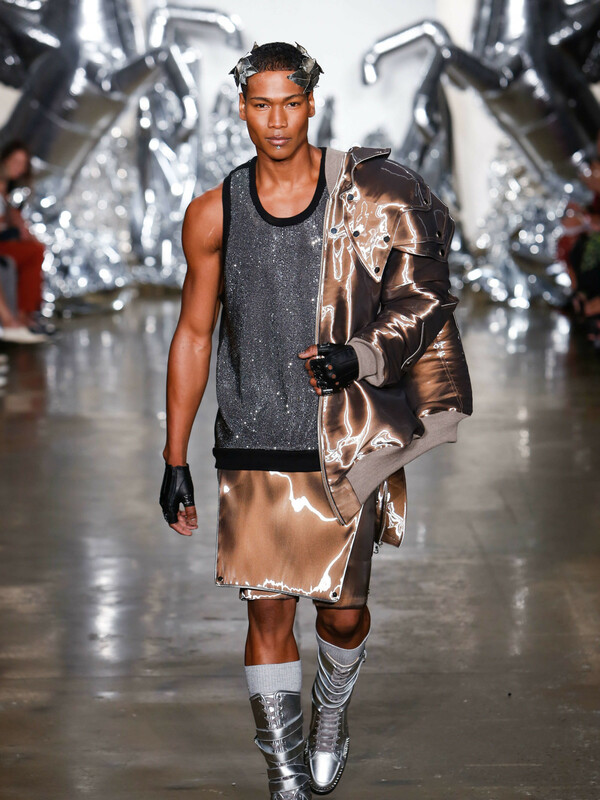 "This collection was inspired by heavy metal meets fashion titans," Phillipe Blonde said afterwards in the American Express VIP Lounge, where the duo spoke exclusively with cardholders who obtained insider access by purchasing a runway show package. Lana del Rey, graphic novels and alien/goddess/robot women also figured into the inspiration mix. 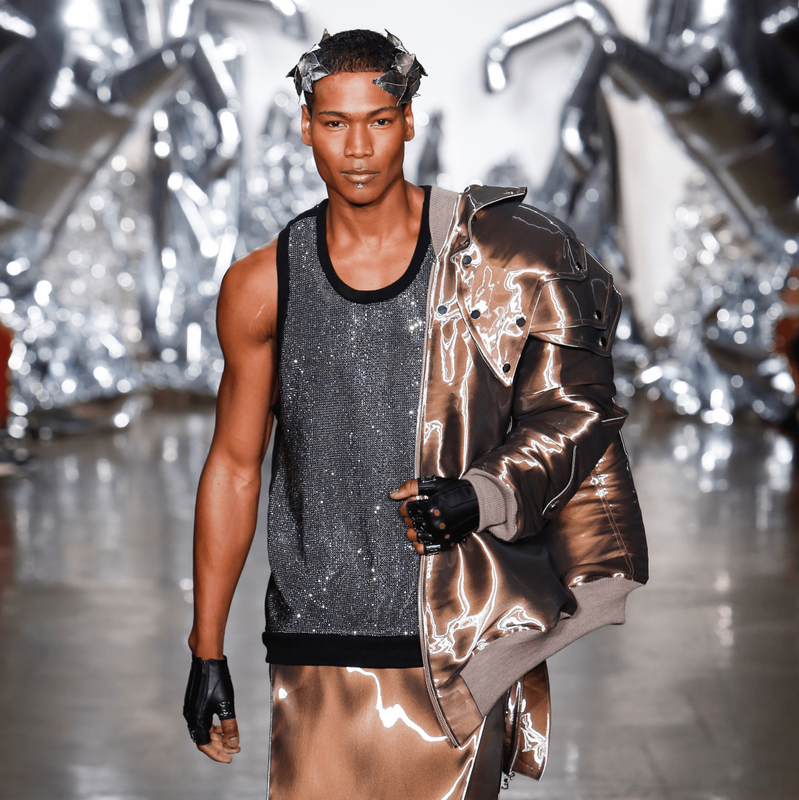 Many looks started with brown to beige body suits emulating statues sculpted from clay, and then embellished with silver laser cut paillettes, chain stud detail and pave crystal embroidery. Beneath the flash, the gowns are painstakingly constructed with intricate corset detail. 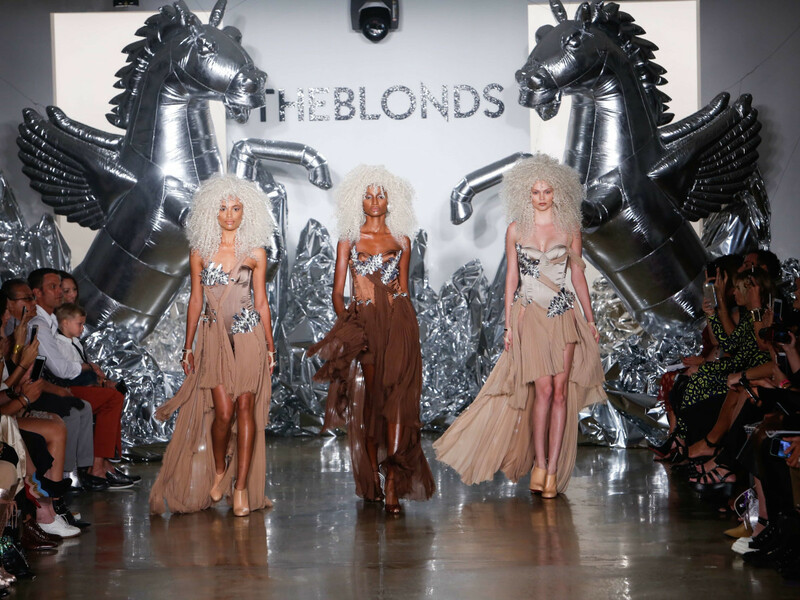 By The Blondes standards, the collection was a bit toned down in presentation from previous seasons, with makeup and nail polish in subdued earth tones. "We stripped everything down," David Blonde said. "But obviously not the hair," Phillipe added, referring to her curly blond mane. 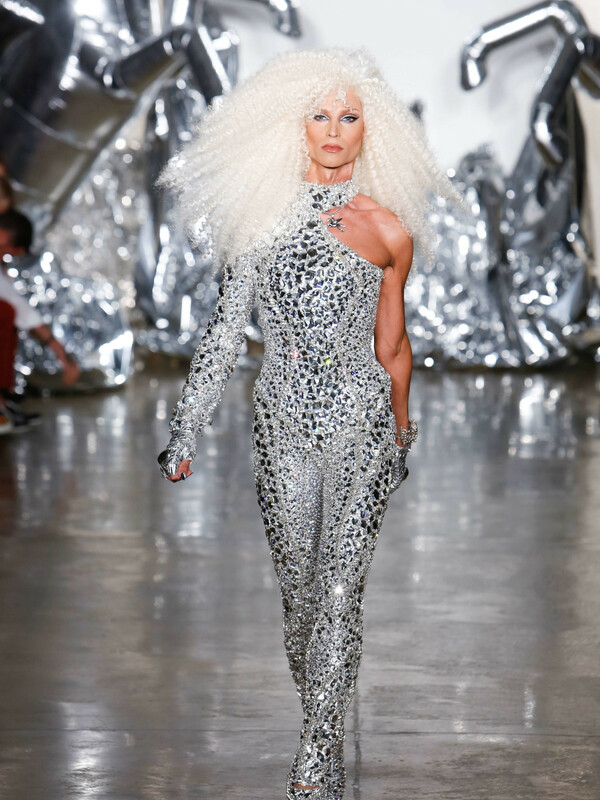 Indeed, Medusa-like blond wigs were the norm, and Phillipe Blond pulled out all the stops in a silver-spangled jumpsuit with matching booties, custom-made by Christian Louboutin, that looked ready-made for a rock star. But the duo admitted they are aiming for the red carpet now, and their wish list to dress includes Zendaya, Cate Blanchett and Tilda Swinton. "These are the ladies that we love," David said. "We are film buffs."